Looking for a stylish and contemporary apartment with a touch of luxury? 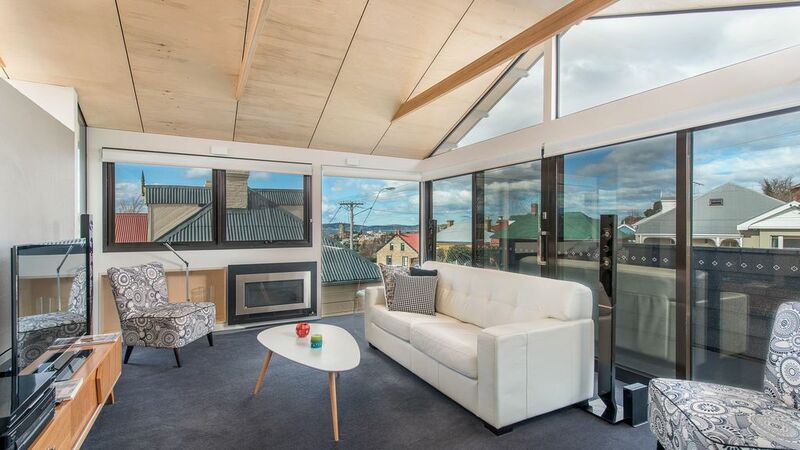 Fusion Apartment is an urban oasis just 100m from the vibrant North Hobart restaurant strip. It’s a short stroll to the iconic State Cinema where you can enjoy a glass of local wine with your movie, and an easy 15-minute walk to the Hobart CBD. Located in a residential area and surrounded by some of Hobart’s earliest homes, Fusion is an architecturally designed passive solar apartment with cross flow ventilation, double glazing and natural gas heating, with comfort ensured year-round. Equally ideal for couples or families, this stunning security-accessed apartment has three split levels with city and water views from the master bedroom, the living room and balcony. The entire home is beautifully appointed with sleek surfaces, quality finishes, and superior appliances. Free unlimited WiFi is included as is access to a washing machine. Your fully equipped kitchen and dining area is a delightfully sunny place to start the day with a coffee from the espresso machine, with a secure private courtyard, BBQ and off street parking accessible from here. The master bedroom has direct access to the main bathroom, and also features a deep deluxe spa bath in the bedroom itself – the perfect way to wind down after a day of sightseeing. A comfy Queen bed is the perfect vantage point from which to enjoy your Netflix selection on the HD television before turning in for the night. A second bedroom contains another Queen bed plus a single, again with an HD television, Netflix and ensuite. If location, luxury, style and comfort are on your wish list, Fusion Apartment ticks all the boxes. Great house, Great location. Worked wonderfully for 2 couples from Canada. Nice up-down separation between kitchen and bedrooms. Nice view. Appreciated some food supplies and the Nespresso machine. A cozy modern home. Loved the upstairs lounge and that we could park off the street. Host was very responsive and super helpful. We are regular visitors to Hobart. We’ve never stayed in such a warm cosy place in winter! The solar passive design of building and the panaramic veiws are fantastic. Highly recommended. Close to lots of eateries and all the attractions of Hobart. The accommodation is everything you expect in an architectural house, pleasing to the eye as well as practical. Love the technological extras wifi, iPad, keyless entry etc. It's close to everything, would definitely stay again.